The Monroe Mandolin Camp has announced that they will be holding three Video Scholarship Competitions this year for Banjo, Mandolin, and Fiddle, and the winners will be decided by esteemed panels of judges. These scholarships will be available for this year’s camp held September 19-23, 2018, at the Lake Junaluska Conference & Retreat Center in North Carolina. Now in its fifth year, this exclusive one-of-a-kind camp showcases instruction in all instruments that make up the classic bluegrass band: Mandolin, Fiddle, Banjo, Guitar, upright Bass, and Vocals. Classes focus on technique and theory, history of Bill Monroe’s musical journeys, melodies and structure of music, and stories as told by Original Blue Grass Boys . The Camp welcomes traditional Bluegrass players of all levels, beginner to expert, and instruction is led by an internationally renowned staff including Original Blue Grass Boys. World renowned instructors for the camp include: (Mandolin) Mike Compton, Skip Gorman, Matt Flinner (taking traditional Blue Grass concepts and ‘Playing it Forward’), Caleb Klauder (Old-Time track), John Keith, Mark Royal, (Banjo) Bob Black, Alan Munde (Fiddle) Byron Berline, (Guitar) Jody Stecher, (Bass) Mike Bub and Luthiers Paul Duff and Will Kimble. The camp experience includes an opening night Square Dance, 30 daily classes to choose from, daily afternoon Special Presentations, daily coffee/story hour, One-on-One Individual tutorials with instructor of choice, daily yoga and chair massage, daily organized jams, and an All-Star Benefit Concert on Saturday night. Winners of the $516.50 scholarship (full tuition and camp t-shirt) will be announced on March 7 (Banjo), April 7 (Mandolin), and May 7 (Fiddle). 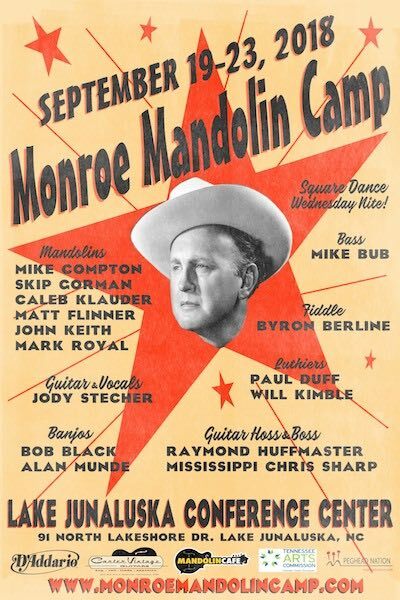 Full details about the Monroe Mandolin Camp Experience and details on how to enter the Video Scholarship Competitions, please visit the Monroe Mandolin Camp Website.